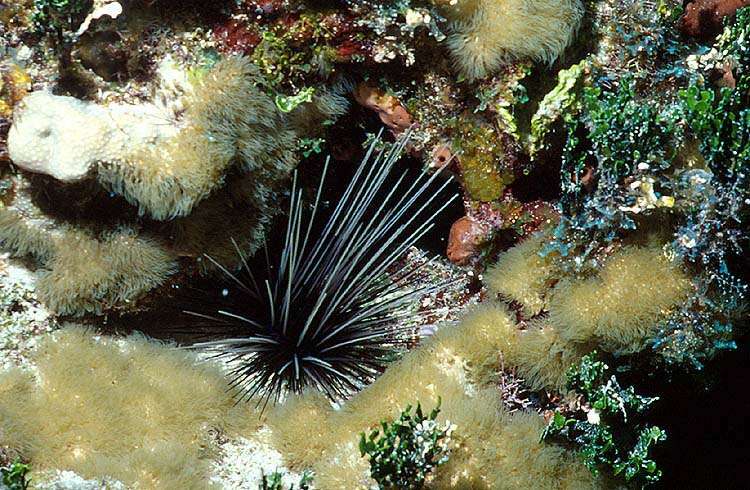 The Long-Spined Sea Urchin is a ball of needles up to 16 inches across. A mature urchin is about the size of a basketball. Sea Urchins eat algae, so it is important to have enough Sea Urchins on the reef to keep the algae from taking over. The needles are very sharp, so it is important to avoid these animals when swimming or wading in the ocean! Too much algae threatens corals. If the conditions are right for algae to grow, then the algae can grow over the reef if there aren't enough algae eaters like this Long-Spined Sea Urchin to eat them. There needs to be a healthy abundance of algae eaters to keep the corals healthy. Learn more about the reefs of Bimini on the ReefNews Bimini webpages. Copyright © 2002, ReefNews, Inc. Questions, Comments? Write to ReefNews@ReefNews.com!